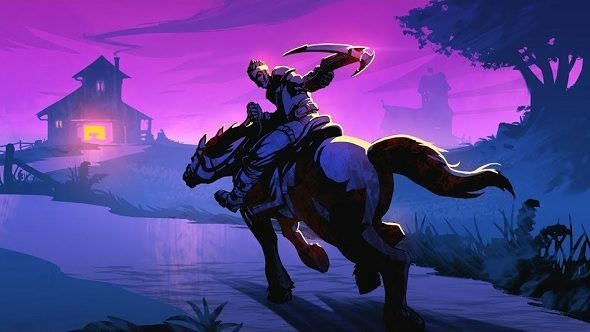 Realm Royale has brought an unexpected medieval fantasy flair to the battle royale genre. Imagine a mix of World of Warcraft’s ability-based PvP with the multiplayer formula that has seen both PUBG and Fortnite shoot up the charts to become global phenomenons. 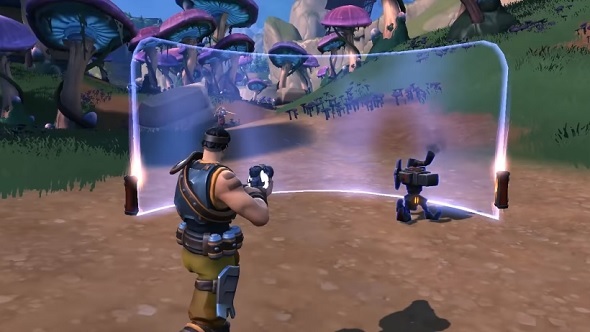 Realm Royale classes certainly give it a fresh angle on its competition. 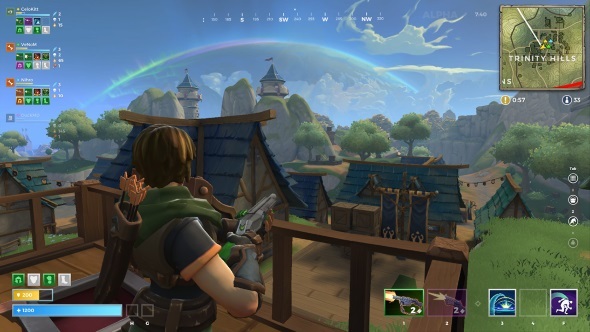 Speaking of its competitors, Realm Royale was late to the game when it arrived on Steam Early Access on June 5, but its steady rise in player numbers goes against the idea that it was at a disadvantage. What’s surprising is that this isn’t the result of developer Hi-Rez Studios leaning on its previous success with Paladins. 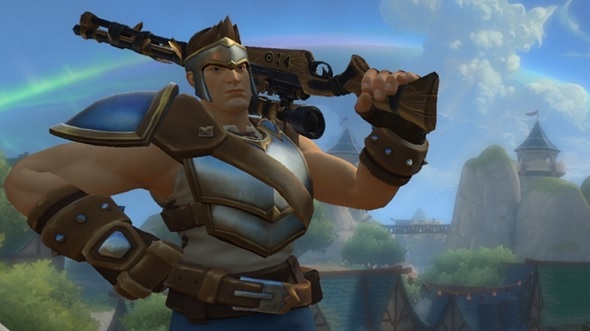 Instead, the studio distanced Realm Royale from its MOBA-like first-person shooter by changing its original title of Paladins: Battlegrounds before it was released. Just getting started? You’ll want to check out our Realm Royale tips. The key to its success could well be Realm Royale classes. Each has their own strengths and weaknesses as you would expect. But which one suits you? That’s where we come in. 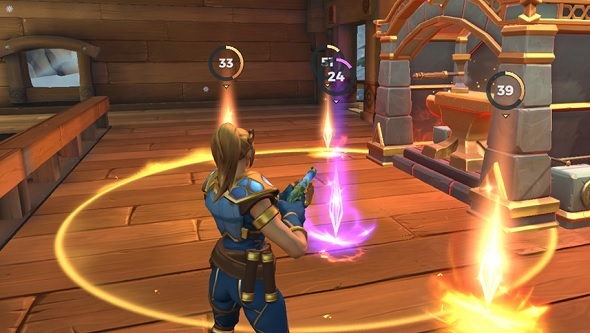 We’ve created this Realm Royale class guide so you can get a rundown of how to make the most of each class and their abilities. – Heroic Leap: use this ability to cover great distances. Great for closing the gap on enemies. – Charge: also good for closing the gap, you can Dash forward to hit enemies for extra damage. – Flask of Healing: throwable healing item to help your allies. – Net Shot: hit enemies with your net and it slows them down. – Shielding potion: another throwable that can buff you and your allies’ armour. A meaty lad, the Warrior is primarily made for survivability and close-range combat. As he comes equipped with passive regenerating health and a range of distance-closing abilities, the Warrior is best played by quickly getting in close, taking the kill, and then retreating to heal up. Surprisingly, the Warrior is a vital healer in squad play as well, with the ability to pick up two healing abilities. With Heroic Leap, the Warrior’s starting ability, and Charge, a looted ability, the Warrior is also good for reaching vantage points and chasing down snipers before they can get a fatal shot off. Both abilities do heavy damage on impact as well so they shine when you want to focus on dishing out the pain. Using Heroic Leap in an enclosed room during a firefight can be a good way to quickly take down an opponent at close range. In squad play, picking up the Flask of Healing or the Shielding Potion abilities is vital to keeping your squad alive. But be warned: the Flask of Healing heals over time, so anticipate incoming damage before it lands. – Deploy Turret: lay down up to two turrets. Great for softening up enemies. – Fire Bomb: if you can get people into a small area, this is great for dealing a lot of damage. – Thrust: jump up high to get to those hard-to-reach areas. – Barricade: drop down a shield to create a defensible position. – Healing Totem: set up this totem to create a spot to help yourself and allies. A source of both useful support abilities and devastating explosives, the Engineer is excellent at vertical mobility and defense. The Engineer struggles with the more mobile Assassins and Hunters, but against the vertically challenged Warriors and Mages, Engineers have the high ground in more ways than one. The Engineer’s main ability, Thrust, allows them to shoot into the air and rain down death from above. Combined with their Fire Bomb ability, Thrust goes from a pleasant bounce to a deadly bombing run. That said, Fire Bomb is the most disposable of the Engineer abilities, so if you have a chance to swap it out, do so. If you get vertigo, the Barricade ability – which sets up a wide defensive shield – and the Deploy Turret ability combine to create a formidable rampart. Just watch out for the manoeuvrability of Hunters and Assassins. In duos or squads, the Engineer’s Healing Totem ability really comes into its own, and becomes an essential pick when you’re deciding between abilities in the field. If your squadmates stay alive, other people die – simple, really. – Blast Shot: a blast that fires out a spread, good for crowd control. – Flare: launch a flare to reveal enemies in a large radius. – Dodge Roll: move a little bit faster and duck out of attacks at short notice. – Withdraw: leap backwards and activate stealth. – Proximity Mine: use to lock down areas with narrow openings. The Hunter is all about mobility and positioning, with an eye towards keeping your distance and picking off targets at range. Lacking close-range options, Hunters are better off keeping their distance from Assassins or Warriors, but thanks to their various movement abilities it’s not too hard to escape if they do come into conflict with them. Dodge Roll is the Hunter’s bread and butter. Simple yet versatile, Dodge Roll can be used to chase down targets, escape enemies who get too close, cross danger zones more safely, reposition after a sniping kill, and more. Combine this with Withdraw, which launches the Hunter backwards and cloaks them for a moment, and the Hunter is probably the most all-round manoeuvrable class in the game. Use the Flare ability to mark enemies hiding in buildings, and use the Proximity Mine ability to cut off their retreat, then flush them out. If you need to finish off your target the Blast Shot ability deals heavy damage very quickly. In duos or squads, the Hunter can use their Flare to locate enemy teams and help get their squad into an advantageous position. – Ghost Walk: move 20% faster and become untargetable. Handy for closing the gap on enemies. – Sensor Drone: reveal enemies in an area for five seconds. The sensor drone is good for scoping out a forge before approaching. – Concussion Bomb: only does a little bit of damage, but the force of the bomb pushes you and enemies backwards. – Smoke Screen: lay down visibility cover, while also turning yourself invisible. – Blink: teleport forwards a short distance to cover ground quickly and confuse your enemy. A sneaky blighter if there ever was one, the Assassin is the master of misdirection and mobility. Like the Warrior, the Assassin is an up-close-and-personal type class, but unlike the Warrior they can’t take a beating, and have a range of abilities based around striking the unaware and then vanishing into the shadows. The Assassin’s starting ability, Blink, is perhaps the strongest default ability in the game. Blink allows you to teleport a short distance forward, making close-range combat a confusing prospect for anyone unwise enough to get near. You can also blink through doorways, windows, and some environmental obstacles, so use it to quickly reposition somewhere unexpected. Smoke Screen is the Assassin’s reset button ability. It drops a wall of smoke that blocks line of sight, allowing the Assassin to reposition or escape. Combine this with the Ghost Walk ability, which speeds you up and gives a few moments of invulnerability, and the Assassin can be tough to nail down. The Concussion Bomb ability knocks everyone back, including you, so it can also be used to reposition, escape, or to catch up to an opponent. The Sensor Drone ability functions similarly to the Hunter’s Flare ability – exposing enemy positions – and has similar utility in squad games. – Fireball: the fireball doesn’t explode on contact, so if you can line your enemies up it can pass through and hurt them all. – Wall: drop this down to block your enemies, either closing a passage or simply slowing them down in their pursuit. – Soar: fly my pretty, fly! – Ice Block: freeze yourself in place in a wall of impenetrable ice. Good for buying time and healing up. – Explosive Flask: smack your enemies with damage and slowdown. The Mage is the most reliant of on her abilities, but once she has them, she’s hard as nails. With a healthy mix of offensive and defensive abilities available, the Mage is a versatile class that can take punches as well as she can dish them out. The Mage’s starting ability, Soar, allows her to reach vantage points that others can’t. It is one of the weaker movement abilities, however, as it’s very noticeable and leaves the Mage open to attack. With the Explosive Flask and Fireball abilities, the Mage can take out opponents with a quick one-two strike. The former deals damage and slows them down, the latter finishes them off. If you want a bit more survivability, picking up the Ice Block ability is a must. It grants invulnerability and recovers lost health. Just be careful you don’t use it out in the open as a lurking sniper could be lining up a shot while you heal. The Wall ability has both offensive and defensive uses – use it to block off the line-of-sight of snipers or a rampaging Warrior, or surgically place it between enemy squadmates so you can cut them off and take them down. That covers every class and ability in Realm Royale. Hopefully, with that knowledge you’ll be well on your way to winning a Crown Royale. Don’t forget about us when you’re winning millions in stadium events and raising trophies above your head. Get out there and knock ‘em dead.